(Download) UPSC IAS Mains Exam Paper - 2017 : Mechanical Engineering | IAS EXAM PORTAL - India's Largest Community for UPSC Exam Aspirants. Pleasc read each of the following instructions carefully before attempting questions. Wherever any assumptions are made for answering a question, they must be clearly indicated. Diagrams/figures, wherever required, shall be drawn in the space provided for answering the question itself. Unless otherwise mentioned, symbols and notations have their usual standard meanings. Q1. 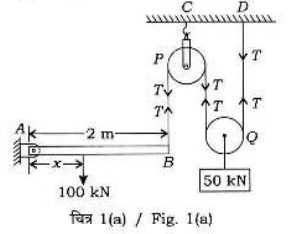 (a) A beam AB of length 2 m, hinged at A and supported at B by a cord which passes over two frictionless pulleys (P, Q), carries a 50 kN load as shown in Fig. 1(a). Determine the distance x, where 100 kN load is located on the beam, if the beam is to remain in equilibrium in horizontal position. Also determine the reaction at the hinged end. (b) A state of plane stress is shown in Fig. 1(b). (d) A steam engine develops 300 kW power at 9.5 rad/s. The coefficient of fluctuation of energy is found to be 0.1 and fluctuation of speed is kept within +0.5% of mean speed. Find the mass of the flywheel required if the radius of gyration is 2m. Q2. 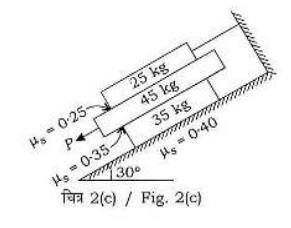 (a) A simply supported beam of rectangular section is 200 mm wide and 300mm deep. It supports a uniformly distributed load of 6 KN/m Over an effective span of 4 m as shown in Fig. 2 (a). Calculate the magnitude and direction of the principal stresses at a point located at 0.50 m from the left support and 50 mm above the neutral axis. (c) Fig. 2(c) shows three fat blocks positioned on the 30° incline. A force P parallel to the incline is applied to the middle block. The movement of the upper block is prevented by attaching to a fixed support by a wire. The coefficient of static friction for each of the three pairs of mating surfaces is shown in the figure. Determine the maximum value which P may have before any slipping takes place. Q3. (a) A solid aluminum shaft 1 m long and 50 mm diameter is to be replaced by a tubular steel shaft of the length and the same outside diameter (i.e., 50 mm) such that each of the two shafts could have the same angle of twist per unit tensional moment over the total length. What must the inner diameter of the tubular steel shaft be? The modulus of rigidity of steel is three times that of aluminum. 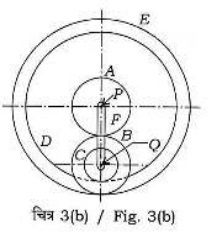 (b) A compound epicycle gear is shown in Fig. 3(b). friar A, Dared I are free to rotate on axis P. Compound gears B and Rotate together on axis Q at the end of arm P. All the gears have equal pitch. The number of external teeth on cars A, B and Gars 18, 45 and 21 respectively. Gears D and are annular gears. Gear A rotates at 100 r.p.m. in counter-clockwise direction and gear D rotates at 450 r.p.m, clockwise. Find the speed and direction of arm F and gear E.
(c) For a eutectoid steel, draw and label continuous cooling transformation (CCT) diagram. Explain normalizing and hardening heat treatment with regard to phase transformation using relevant cooling curves on CCT diagram. Q4. (a) Four masses A, B, C and D are attached to a shaft and revolve in the same plane. The tresses are 13 kg, 10 kg, 18 kg and 15 kg respectively and their radii pouf rotator are 40mm, 50mm, 60mm and 30mm respectively. The angular position of mass B, C and D arc60o 135o 270o from the mass A. Find the magnitude and position of balancing mass at a radius of 100mm. (b) Draw the stress-strain diagram for mild steel and describe the salient points of the curve. (ii) Coefficient of sensitiveness, if the friction at the sleeve is equivalent to a forces of 10 N.
Q5. (a) Electrochemical machining of 400 mm2 surface of iron is performed using supply voltage of 15 V and tool-workpiece gap of 0.3 mm. 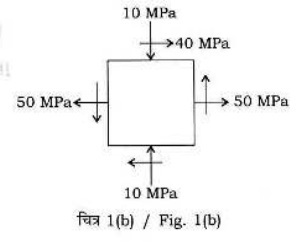 Considering gap resistance for the flow of current through electrolyte to be 0.0015W ,calculate the frietal removal rate, MRR (m3/s). (b) An annealed copper plate of 300 mm width and 20 mm thickness is rolled to 16 mm thickness in one pass. Considering radius of the roller as 400 mm, rotational speed of 80 r.p.m. and average flow stress during rolling as 400 MP3, calculate the true strairi and rolling force (kN). (c) The machining of steel is carried out using two types of cutting tool, i.e., tool A and tool B. Data/technical parameters related with tools are given below in the table, which tool will you prefer for 200 minutes of tool life and why? (d) Describe the philosophy of lean management including waste and value stream with regard to manufacturing. (e) The demand for an item is 500 units and 600 units for July and August respectively. Considering forecast for July as 300 units, determine the forecast for September using exponential smoothing method. Assume value of a as 0.3. Calculate the shear planc angle, friction force (N), normal force (N) and coefficient of friction at chip-tool interface. (c) Explain the principle of abrasive waterjet machining using suitable schematic. Write the advantages and applications of abrasive waterjet machining. (b) Lathe machine operations take 40 min to produce a product. If the efficiency of the lathe machine is 80% and rejection is 20%, then determine the number of lathe machines required for producing 800 pieces per week. Assume 52 weeks per year and 48 hours per week as working hours available. However due to changing market condition, variable cost incrcased by 20% and fixed cost increased by 10%. If the breakdown quantity is maintained, then what will be the revised selling price? (c) Describe different types of control systems possible for CNC operations along with respective applications using suitable schematic. Q1. (a) An insulated rigid tank is divided into two cqual parts by a partition. Initially, one part contains 4 kg of an ideal gas ar 800 Kpa and 50oC. While The other part is evacuated. The partition is now removed and the gas expands into the entire tank. Determine the final temperature and pressure in the tank. (b) Show processes of saturated vapour compression refrigeration cycle on p-v, t-s and p-h diagram and mark graphically on t-s diagram refrigerating effect, heat rejection by condenser and compressor work. (c) What is the shape factor in case of radiative heat exchange ? Discuss the four (4) basic shape factor laws. (d) Draw valve timing diagrams of 4-stroke high speed and low speed SI internal combustion engine. Q2. (a) The efficiencies of the compressor and turbine of a gas turbine are 70% and 71%, respectively. The heat added in the combustion chamber per kg of air is 476.35 kJ/kg. Find a suitable pressure ratio such that the work ratio is 0.054. Also find the corresponding temperature ratio. The inlet total temperature of air is 300 K.
(b) A flue gas stream is to be monitored for its temperature using a thermocouple. The thermocouple design needs to be evaluated in terms of its time response to accurately predict the measured temperature. The thermocouple junction can be approximated as a sphere of diameter 0.6 mm, density of the bead material (p) 8500 kg/m3, thermal conductivity (k) is 310 W/rn-K; specific heat (c) is 0.3 kJ/kg-K. The convective heat transfer coefficient (h) between the junction and flue gas is 300 W/m-K, Determine the time required to read 90% of the initial temperature difference. Neglect radiation effect and change in thermo physical Properties with temperature. (c) Classify different types of boilers and discuss factors important for the boiler selection. Q3. (a) In an open heart surgery, under hypothermic conditions, the patient's blood is cooled before surgery and rewarded afterwards. It is proposed that a concentric tube counter flow heat exchanger of length 0.5 m is to used for this purpose, with a thin walled inner tube having diameter of 55 min. If water at 60°C and 0.1 kg's is used to heat the blood entering the heat exchanger at 18°C at a flow rate of 0-01 kg/s, what is the temperature of the blood leaving the heat exchanger ? one may assume, overall heat transfer coefficient (LU) = 500 W/rfm-k, specific that of blood and water are respectively Cpblood 3.5 kJ/kg-K, Cpwater = 4.187 kJ/kg-K.
(b) A single cylinder 4 stroke SI engine is producing 100 KW power at an overall efficiency of 20% Engines use a fuel-air ratio of 0.07 : 1. Determine how many m3/hr of air is used if air density is 1.2 kg/m). The fuel vapour density is 4 times that of air. How many m/hr of mixture is required ? Calorific value of fuel is 42000 kJ/Kg. (c) The pressure in an automobile tyre depends on the temperature of the air in the tyre. When the air temperature is 25°C, the pressure gauge reads 210 kPa. If the volume of the tyre is 0.025 m, determine the pressure rise in the tyre when the air temperature in the tyre rises to 50°C. Also, determine the amount of air that must be bled off to restore pressure to its original value at this temperature. 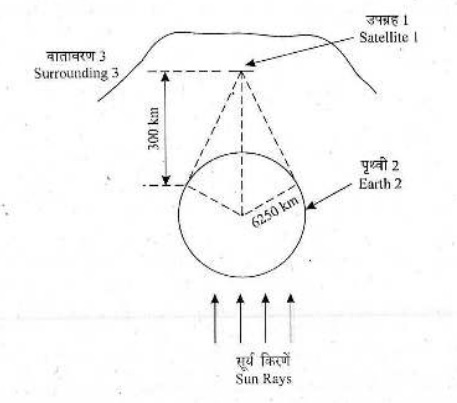 Assume the atmospheric pressure is 100 kPa and gas constant of air, R = 0.237 kpa m3/kg-K.
(i) Draw the inlet and exit velocity triangles for the rotor and prove that the work is given by = wc = 1/3u2. (ii) Calculate the pressure rise, take a constant density of air, P= 1.25 kg/m. (c) Explain clearly what is thermally developed zone" in case laminar flow through a tube both for (i) constant all temperature case (ii) constant heat flux case. Q5. (a) What is the difference between 'normal' and 'oblique' shock ? State the significance of each. (b) Explain harmful effects of R-12 and R-22 refrigerant. Write their chemical formula and NBP temperature. Also suggest new eco-friendly substitutes of these two with chemical composition. (c) Discuss experimental determination of calorific value of solid fuel with a neat diagram. C 80; H2 16; and ash etc. 4. Determine the minimum weight and volume of air required to burn 1 kg of this fuel. Density of O2 is 1.429 Kg/m3? Q6. (a) A single stage, single acting vapour compression refrigeration system uses R-134a. Condenser and evaporator temperatures are 35°C and -10°C and refrigerant is under-cooled by 5°C. Clearance volume per swept volume is 0.03 and swept volume is 269.4 cm. Compressor speed and efficiency are 2800 rpm and 80% respectively. Expansion index is 1.12. Determine (1) Compressor exit temperature (ii) Enthalpy of refrigerant at compressor exit (iii) Enthalpy at the exit of the sub-cooler (iv) Volumetric efficiency of compressor (v) Refrigerant mass flow rate. Specific heat of vapour and liquid at condenser pressure are 1.1 kJ/kg-K and 1-458 kJ/kg-K respectively. Assume suction vapour dry saturated and isentropic compression. (c) A supersonic wind tunnel settling chamber expands air through a nozzle from a pressure of 10 bar to 4 bar in the test section. Calculate the stagnation temperature to be maintained in the settling chamber to obtain a velocity of 500 m's in the test sectio11. Take C = 1.025 kJ/kg-k and Cur = 0.735 kg/kg-K.
(i) The average earth surface temperature is 27°C and the Earth is black body. (iii) The part of the satellite surrounding not occupied by the earth is black and at O K.
(iv) Stefan-Boltzimann constant = 5.67 x 10-8 W/m2-K4. (c) Differentiate clearly between ventilation and infiltration. Discuss the methods of cstimation of infiltrated air. (b) In an air-conditioning plant, an air handling unit supplies a total of 4000 m/min of dry air which comprises by mass 20% of fresh air at 39°C DBT and 26°C WIT and 80% re-Circulated air at 24°C DBT and 50 RII. The air leav19 the Cooling coil at 12°C saturated: Using Psychometric chart calculate (i) Total cooling load and (ii) Room heat gain. Also slicow the process on Psychometric chart. (c) Write down the assumptions to analyze a counter flow heat exchanger using LMTD (Log mean temperature difference) method and also write down the expression for LMTD in a counter flow heat exchanger with the help of terminal temperatures.